The most ambitious manifestation of the Colony protocol is the ‘True DAO’. True DAOs solve the problems of coordination, cognition, and collaboration traditionally solved by ‘the firm’. The difference is that rather than relying on the traditional hierarchy, they distribute authority throughout an organization or community without requiring any central point of control.Thousands of people, all over the world, can build, manage and share in the rewards of a common endeavour, without trusting (or even knowing) one another. Over the next few months we’re releasing a series of articles we’re calling‘Visions of the Future’. We’ll be working with artists and innovative projects around the Ethereum and decentralization space to imagine what a future in which True DAOs have become possible looks like. For each article we’re commissioning an amazing piece of art to capture the spirit of the innovation, and we’re making them available to download freeunder a non-commercial creative commons license. So, if you’d like to get them framed to show your love for the Ethereum ecosystem, please feel free. In this first article, we interview rLoop’s Brent Lessard to discuss rLoop — an open source project created by several hundred globally distributed redditors, who are through to the final round of the SpaceX Hyperloop pod competition. We discuss the project, the challenges they face as a decentralized organization, and their vision for the future. 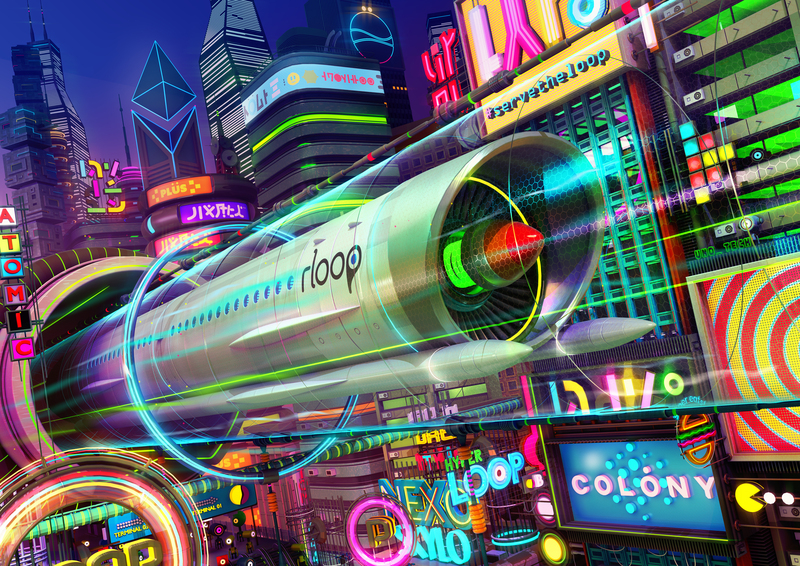 To accompany the interview, we’ve commissioned the incredibly talented Jon Ball of Poked Studio to imagine rLoop’s Hyperloop hurtling through the city of tomorrow, all watched over by the benevolent Eth. Available to download free for non-commercial use. Q. How did rLoop come to be? A. rLoop started with a post on the SpaceX subreddit (reddit.com/r/SpaceX) following the announcement of the Hyperloop Design Competition. The post was titled “Let’s work on a submission for the Hyperloop design competition”. The suggestion was that we had ample expertise among the community to put forward a compelling design and help accelerate the Hyperloop concept. That post spurred a lot of interest. A “sign up” spreadsheet was created and several hundred people of diverse technical backgrounds and geographical locations started to volunteer their time towards the project. We started our own subreddit, initially named “redditloop” but quickly changed to avoid potential legal issues, and so “rLoop” was born. 15 months later we’re incorporated as a non-profit in the State of California, we have over 300 active members, we’ve had over 800 members over our lifespan, more than 15 countries represented by our members, over 500k messages exchanged on Slack, we’re a finalist in the SpaceX competition, and we have a dedicated manufacturing site and team in Menlo Park, California. Q. How do people get involved with rLoop? Q. What tools do you use to coordinate as a distributed organization? A. There was a learning curve in respect to the tools we require to facilitate our work, but we adapted quickly (out of necessity) to mitigate our weaknesses and capitalize on our strengths. Slack is used for all team communication. The ease of use, ease of customization, and compatibility with other platforms made Slack the ideal platform for us. We’ve never used email internally for rLoop. rLoop uses Autodesk Fusion360 for the majority of our CAD work. It’s a cloud based and collaborative software that enables our globally distributed team to design together in real time. We use google drive for all documents and file storage, and they’re easily accessible through Slack thanks to a bot we created to link files when certain commands or keywords are typed. This allows instant access without having to exit slack and dig through a mountain of files. Slack also has Google Hangouts integration, which we use for meetings when necessary (though we try to keep all meetings in slack for documenting and review purposes). For task management we use Jira, and the Software and Controls teams use GitHub. We organized into subsystem teams and tasked the teams with a relevant scope of work as it pertained to the Hyperloop pod. The competition rules outlined the system requirements and milestones needed to be achieved. rLoop’s philosophy from the beginning was “All of us are smarter than one of us”. We wanted everyone to have a voice, and the team to rally behind the best solution. Q. You raised money through crowdfunding—did this change the way you structured rLoop? A. The crowdfunding campaign was very exciting for us. We wanted to have a community emotionally invested behind us, and we wanted to add ‘crowd funded’ to our ‘crowd sourced’ moniker. Every rLooper is passionate about the project; we believe the Hyperloop to be the future of transportation, and we’re doing it for the benefit of all. The team worked together on the campaign. Our video team put together a fantastic launch video (which reached #1 on /r/all on reddit!) and our PR team did a lot of outreach and promotion to relevant outlets. We quickly picked up a sponsor in Soylent, and collaborated with an amazing twitch channel called HyperRPG (twitch.tv/HyperRPG) to produce a 12-hour stream FOR SCIENCE! That community raised $17,500 for rLoop in a 12 hour period — truly outstanding. The finance team was charged with monitoring the bank and paypal accounts of rLoop using a platform called Xero, and made reports available within the team. This way anyone could check on the transactions and financial status of the team — keeping with our entirely transparent and open philosophy. In short — no, the campaign did not change the structure of rLoop. Any member was welcome to participate, and all members had full access. Q. What can you tell us about the people working on rLoop? A. There is a very passionate team behind rLoop. We currently have over 300 people active on Slack and have had over 800 people from all over the world sign up during our lifespan. There is a core group of approximately 50 people who have been involved since our inception, whom you can count on to be around daily. Some people sign up to check out what the team is working on and then leave. And we have our ‘shooting stars’ — members who sign up and are very enthusiastic. They contribute immensely in a short period of time, and then they burn out or other obligations prohibit their involvement. It’s part of rLoop, and we’ve learned how to mitigate such occurrences. All rLoopers are passionate about the concept, and that is their primary motivation. The opportunity to be involved in such a large scale “moonshot” project, to advance a technology that has the potential to have such a large and positive impact, and to achieve these goals in an entirely unique and innovative way, is incentive enough for most. Everyone is a volunteer at rLoop. Most have day jobs to support themselves and work outside of work hours on rLoop. Some people have taken extended vacation to work on the project in person at our manufacturing site, others come to the site on weekends. Q. How does the team work together? A. The timeline for the competition is ambitious, and we’ve had to keep pace. One benefit to a globally distributed team is the ability to work around the clock. I can start or contribute to a task, pass it off when I sign out at night, and when I wake up it has been worked on by two or three others and developed much further. Due to the nature of the team and the complexity of the project, we’ve done our best to break down tasks into ‘bite’ sizes, or micro-tasks, such that someone new to the team is capable of contributing in a meaningful way without having to read hundreds of pages of design history. As I mentioned previously, everyone is given a voice and the opportunity to be heard, and the team rallies behind the best solution. We’ve not seen many disagreements with this approach, but one occurence does come to mind: the choice between air bearings or magnetic levitation for the pod. Elon Musk initially proposed air bearings to levitate the Hyperloop pod within the tube, but the lift provided would be less than a millimetre. Using magnetic levitation we could achieve at least 5 times that hover height. When the time came to choose a route to pursue, there was a number of rLoopers who wished to stay pure to the original proposal, and a portion who preferred the magnetic solution. We alloted a certain amount of time for all sides to present their case, a pros/cons comparison was compiled, we had several all-team meetings to discuss, and then we created a bot to allow people to vote anonymously on their preferred method. The magnetic levitation system won. Q. rLoop may eventually become a for profit business. How do you think that might change rLoop? A. It’s a challenge we’re working on. rLoop represents a new method of organizing and strategizing, and to date has operated on the passion that all members bring to the team. Everyone here wants to participate in moonshots with potential to benefit all of humankind, and that has been the primary incentive. We want to see the Hyperloop become a reality. Our principle philosophies centre around an open and transparent community, so any decision to alter the operating methods of rLoop will be made by and for the benefit of that community. Our hope is that Colony will help our decentralized, globally distributed team efficiently operate democratically, track and reward people for their contributions, and demonstrate proficiencies within the team. We want the team to be altruistic and moral, but also capable of providing value. Q. What is your future vision for distributed organizations generally and rLoop specifically? A. I believe in the power of open source collaboration, and I know there is a lot of value in the processes we’ve developed at rLoop. We fully intend to explore that potential further. I believe individuals can have a massive impact when their passion is their incentive, and when they know they are making a difference. rLoop certainly represents a new type of organization in this context. I, along with everyone at rLoop, believe the Hyperloop is the next revolution for transportation. It represents clean and energy-efficient transport that will bring the world much closer together. rLoop’s current focus is accelerating its development and seeing it become a reality. Together we are revolutionizing transportation, and our approach to realizing it is just as revolutionary.Q. rLoop may eventually become a for profit business. How do you think that might change rLoop? I, along with everyone at rLoop, believe the Hyperloop is the next revolution for transportation. It represents clean and energy-efficient transport that will bring the world much closer together. rLoop’s current focus is accelerating its development and seeing it become a reality. Together we are revolutionizing transportation, and our approach to realizing it is just as revolutionary.